Foreign Minister Gbehzohngar Milton Findley on Wednesday, November 21, 2018, received in audience the Apostolic Nuncio of the Vatican accredited to the Republic of Liberia H.E. Archbishop Dagoberto Campos Salas, Apostolic nunciature of the Vatican when he presented copies of his letter of credence to him. According to a Foreign Ministry release, the colorful ceremony took place in the Holding Room on the 4th floor of the Ministry of Foreign Affairs. Performing the ceremony, Foreign Minister Findley welcomed Archbishop to Liberia and thanked him for presenting copies of his credential to him. Minister Findley promised to work out modality for the Archbishop to officially present his Letters of Credence to His Excellency Dr. George Manneh Weah, President of the Republic Of Liberia. The Dean of the Cabinet assured him of his Ministry’s readiness to work with the Apostolic Salas so as to make his tour of duty in Liberia productive and rewarding. The Minister looks forward to a good working relationship with the Apostolic Campos aimed at deepening the existing cooperation between Liberia and the Vatican. For his part, Archbishop Dagobert Campos Salas, assured Minister Findley and Liberia of the Catholic Church’s continued support to Liberia, especially in the areas of health, education and soul winning which he added are geared towards promoting Human dignity. Furthermore, Archbishop Dagobert Campos Salas indicated that he is proud and honored to be a Representative of Pope Francis of the Catholic Church in Liberia. 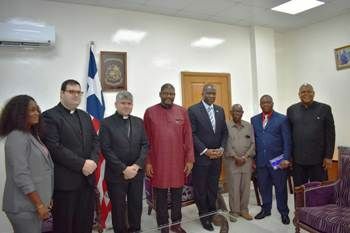 While applauding Minister Findley for the warm reception accorded him since his arrival in Liberia, Archbishop Salas pledged the Church’s commitment to collaborate efforts with the Liberian Government in addressing critical challenges. The ceremony was attended by Honorable B. Elias Shoniyin, Deputy Minister of Foreign Affairs; Ambassador Ibrahim Nyei, Ambassador at large; Ambassador Jervis Wither Spoon, Chief of Protocol of the Republic of Liberia and Hon. Abratha P. Doe, Assistant Minister for European Affairs amongst others.